The strongest among us can still fall to temptation! You could be making fantastic progress toward debt freedom and then a new truck pulling a new boat passes you on the road. If you’re not careful, you’ll also be pulling a new truck and boat down the road! There are two key ways to ensure you are held accountable to your goal of debt freedom! If married, work together with your spouse. If unmarried, have someone you trust (someone who has won with their money) hold you accountable! There is incredible power when you work together with your spouse towards debt freedom! It is a common goal that will unify your marriage and cement your commitment to managing your resources together.I have also found that when I have a bad case of the “I wants” and “I gotta-have”, Jenn does not. She shuts me down! Then, when Jenn gets a bad case of “I really want this”, I do not. I shut her down! Why? Because we are not doing debt! We are THROUGH with it!! Plan your spending every single month! Planned money goes farther than unplanned money! Every single month, Jenn and I still down TOGETHER and spend every single dollar on paper before we are paid. Don’t miss this!! Every. Dollar. On. Paper. BEFORE. We. Are. Paid.I can tell you this. I HATED the idea of budgeting and now all I do is yell from the mountaintops about how important it is and how EZ it is to budget! There are FREE budget tools that are available HERE. Use one of them to start your journey to debt freedom! Your budget will hold you accountable. I wouldn’t be surprised if it helped you free up $200-$500 per month to attack your debt even harder. Also, make sure to add some FUN into your liberation from debt! I know that money can make you so frustrated that you want to pull all your hair out, but add some fun into it! You could make your debt pay off visual. Check it out HERE. To learn more about becoming debt free, check out my book, I Was Broke. Now I’m Not. We can all agree that debt is a drag. It hangs on like a bad relationship or a fixer-upper money pit house. Anyone, when given the choice, would choose to be debt free over paying debt payments every month. The average family possess credit card debt, student loan debt, furniture debt, vehicle debt, and a personal loan or two. Then a house payment enters into the picture. Every single month, 40% or more of the family’s income is “dead on arrival” because it must immediately be sent out to lenders. Let’s work on changing that! With Steps 1-3 complete, we can now focus on actually paying off the debt using the Debt Snowball Technique! Let me explain the process for using the Debt Snowball Technique. List ALL debts from the smallest balanced owed to the largest. Pay the minimum payment on all debts except the smallest one. Pay as much as you can on the smallest debt. When the smallest debt is eliminated, take the monthly payment you were paying for that debt and add it to the monthly payment you’re making on the second smallest debt. Continue this process with a vengeance until you are debt free!! I highly recommend this technique because you will see individual debt payments disappear more swiftly from your monthly budget. For more information on the Debt Snowball Technique, grab a copy of my latest book, I Was Broke. Now I’m Not. When I meet with people, it’s a guarantee that I will calculate their debt freedom date. When I do this, it’s clear that people do not like debt! It’s also apparent that people have not been paying attention to their finances and do not have a well-defined plan for their life. Otherwise, they would not have incurred most of the debt. However, there is always HOPE and a way out! You can list these on the Debt Freedom Date Calculator. 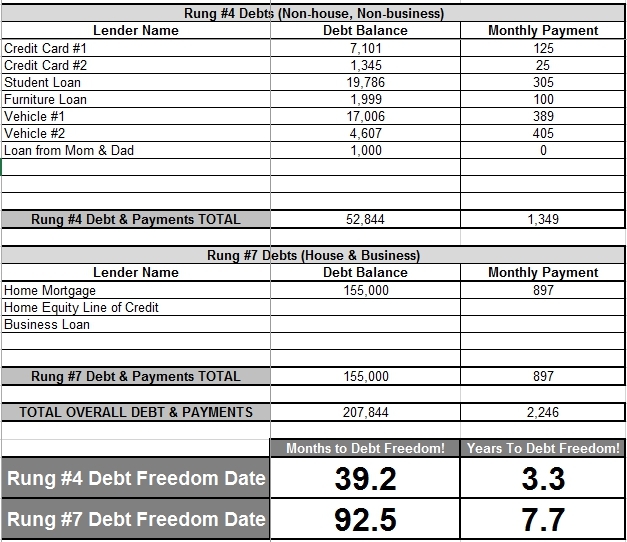 Now we can calculate your debt freedom date! This date is simply the date that you will be debt free (including and excluding the house). Let’s look at a sample. In this sample, the couple listed all of their non-house, non-business debts, as well as their house debt. After all of the debts are inputted, the debt freedom date is calculated. This couple will be debt free, excluding the house, in just 3.3 years and completely debt free, including the house, in 7.7 years!! Get fired up! Are you ready to take your next step? You can calculate your debt freedom date HERE! IMPORTANT NOTE: When you take this next step to become debt free, you must eliminate the potential for new debt! If you keep swiping the credit cards and running up the balance, you’re just eliminating your potential of becoming debt free. Have you calculated your date? How many months until you’re debt free? I have found that a large group of those who attend one of my events, are living paycheck-to-paycheck AND carrying debt. In fact, statistics from a recent survey I conducted show that 57% of people are living paycheck-to-paycheck and 73% of people are in debt (excluding the mortgage). When asked how people are doing with managing their money, 45% said that they were barely keeping their head above water or drowning! Only 9% of people feel like they are winning with their money! No matter where I go, I see the footprint of debt on people’s lives – marriages failing, stress and depression taking over, and hopelessness closing in. And all of this is happening in the wealthiest country on the planet! This is entirely unacceptable! I WANT YOU TO BECOME DEBT-FREE!! It changes your life! It enables you to accomplish far more than you ever thought possible with your personal finances! It allows you to do exactly what you were put on earth to do – regardless of the income! In this series, I’m going to share the process that I followed to become debt free. Are you ready? I believe this is the most important step in becoming debt free! In the hundreds of financial coaching sessions that our team has led, it’s amazing how many people do not have a plan for their lives. We ask them the “why” and they stare at us like we’re speaking a different language. Unfortunately, this is the first time that many of these people have ever seriously thought about what they want to accomplish with their lives. As a result, they are bumbling through life just trying to make it through the day. What a miserable way to live! I cannot overstate this fact – YOUR LEVEL OF EXPECTATION DETERMINES YOUR LEVEL OF PREPARATION! When Jenn and I wrote down our plans, hopes & dreams on paper, we realized that our lack of money management proved we had no real expectations of accomplishing these plans, hopes & dreams. We wanted to move back to South Carolina to take a job that paid way less than what we were making, but every single dinner at Outback was robbing us of that opportunity. Every single debt payment went off to make the bank wealthy while at the same time robbing us of our God-given dreams! That made me MAD! It made me FURIOUS! It made me realize how incredibly stupid I was to be managing our money so crazily! I had a significant amount of our income going to pay car debt, credit card debt, and student loan debt. Add in the stupid house payment, and I had thousands of dollars per month running off to make the bank wealthy! By writing out our plans, hopes, & dreams on paper, Jenn and I were motivated to manage our money differently. It caused us to view debt differently. Take your first step today by writing down your plans, hopes & dreams. If you are married, you need to do this separately and then take time to discuss it with each other. By the way, one of my plans, hopes, & dreams is for you to become debt-free! What has kept you from attacking your debt?